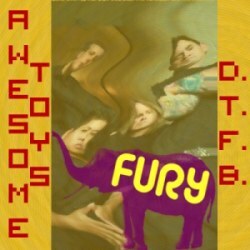 Originally released in March of 2014, ‘Do The Fury Boogie’ was the standout track on the Awesome Toys’ ‘difficult’ second album, How Dare You Say You Love Me When You’ve Taken The Only Parachute,which divided the fans on the issue of whether or not it was rubbish and, indeed, whether there weren’t more important things the band could have been doing, like being with their loved ones. It’s a mysterious song – Geberhart sings from the point of view of an albatross whom lonely mariners have taught to dance by the expedient of tying heavy mechanical parts to the tips of its wings, an odd little conceit that somehow works when Geberhart relays it in his croaking, ruptured monotone. It’s what Yellow Submarine might have sounded like had it been performed by a snail. -London is full of yobs and foreigners: The only characters in Somers Town from London are the three (white) kids who mug Tommo, the café owner and Graham the spiv. And you can see this clearly in the way that Graham is holed up in his survivalist bunker of a flat. Everyone else is either from the regions or foreign. -The foreigners are getting crafty. In the old days it was easy to spot an immigrant, they were a different colour. These days the Frenchies and the Poles which fill up Somers Town LOOK LIKE US. At least no Black or Asian people live in Somers Town. -Isn’t social housing nice? Well not nice, but surprisingly quiet for Central London, when apparently only two flats are occupied. Though one by an immigrant. Who is the greatest comic artist ever? Obviously that is unanswerable, but my top choice would be Alex Toth. This is partly because he was magnificent in every style he used, and he did it all – superheroes, romance, horror, funny animals, war, SF, westerns, pirates and anything else you can think of. I think his heart was most in swashbuckling adventure, harking back to Flynn and Fairbanks. He did great work on various such comics, and his fine Zorro work is collected in a couple of volumes, but I guess the work to point anyone to is Bravo For Adventure, starring dashing aviator Jesse Bravo. This is collected in one mag, which you might be able to buy if you’re lucky. The first story is particularly astonishing – for 16 of the 17 pages Jesse is unconscious, and in pages with three tiers of two panels each, Toth shows off his mastery and brilliance with a series of breathtaking black and white compositions and the best grasp ever of where to put in detail and where to go minimal. It also features a small tribute to Hugo Pratt (see below). Absolutely anything by Toth is worth grabbing when you see it – even on the most throwaway pieces of work, his peerless craft and compositional ability is unmistakeable. I’ve never really been interested in buying original comic art, but if there is one page I would choose, it would be this from a car story in DC’s Hot Wheels. There are a couple of lovely art-book format collections of some of his work, if you can find them, but it’s not always his best. So the UK won more medals than ever before. Well ever if you don’t include 1908 which forevermore will be known as the British Cheating Olympics where we made up most of the sports and the competitors at the Olympics. But the question on everyone lips here at FT is, did Pete manage to avoid less that fifty nine minutes of it. If we are discounting the opening and closing ceremonies (which we are, because its my game with my rules) then the answer is YES. I only got another three minutes of tedium in over the weekend (OK four if you count the replays of a British woman kicking someone in the head in the Tae Kwon Do). So my final Olympic Avoidance Time works out at less than 51 minutes, and a new Personal Best. And yet. I feel like there has been more Olympics around. I can’t say this is a genre that I think has seen many of comics’ great peaks – some of the best comes in bits and pieces here and there: old stories in comics by various publishers by Alex Toth and Jack Kirby and the like. Frankly, even then the stories are mostly inconsequential, and they aren’t terribly easy to find. I’m not a big fan of Moebius’s SF, but I do like his art on the Lieutenant Blueberry series (pictured). It’s written by Jean-Michel Charlier, and drawn under Moebius’s real name, Jean Giraud, and the feel is more like a classy late Clint Eastwood than any earlier US or European westerns. The angle is interesting: our protagonist is a Southerner who fought for the North in the Civil War due to his conversion to anti-racist beliefs, and the stories focus on this. They are compelling and muscular, and Giraud’s art matches this – none of the flash of his SF, just superb comics art. There are lots of volumes in English – the series names are varied (Lieutenant, Marshall, Young…), but the word Blueberry is your clue. question: who should create and direct it? You know what bugs me about the massive proliferation of Olympic sports. its how many of them are just about doing exactly the same thing in a slightly different way. Watching a minute of another Team Great Britain and Northern Ireland gold in canoeing I noticed we were, yet again, back in the piss and algae filled rowing lake. A lake which has been traversed by long distance swimmers, canoeists, sculls, row row row-me-boats. All to get across the same bit of water. Can’t they make up their mind as to the best way to get across it, and just stick to that method. At least there only seems to be one properly sanctioned way of travelling 100m in the Olympics, and that’s by leg. 1. The Fabulous Furry Freak Brothers Omnibus comes out on September 20th, a real bargain at 624 pages (over a third in colour), featuring all the stories ever. I recommend it very highly. 2. Gilbert Shelton will be at Gosh Comics (39 Great Russell St, London, almost opposite the British Museum) on Saturday, September 13th, 2-4pm, to sign copies (so you can also get yours early). It’s very rare for there to be a signing by a veteran artist of his calibre , especially one not UK-based – well, except he will also be in OK Comics, Leeds, the day before (3-5pm), and Dave’s Comics, Brighton, the day after (don’t know the time). (Apparently according to the BBC, its actually Day 14 of the Olympics – which means I have successfully avoided three whole days). I’m back from my holiday now, so work luckily has massively helped me avoid the Olympics. Because it is mostly on at night (when I am asleep) or the day (when I am at work) I feel that the record could be in my reach. All I accidentally saw today was part of the mens 10K swim, which is MADNESS I tell you. And appears to cause it too. In the interview afterwards the Brit who came second was asked about the last half of this two hour race. He admitted he couldn’t remember much and was pretty much delirious though that period (which explained why he couldn’t swim straight). So the Olympics have come to this, a sport where people can pull your shorts down, and kick you in the head whilst you poison yourself in a lake and lose the ability for rational thought. ACES! When I was a kid, I thought the Olympics was just an athletics competition. This was before the red button and us being good at anything that involves sitting down. (Note how many of our medals have been in sports where you get to sit down). No it was runnin’, jumpin’, throwin’ and gettin’ told off for doing the javelin’ in the back garden with a bamboo cane. That event never went away. But in this Olympics, even a studied Olympic avoider has noticed that the athletics has been played down a touch because we did not expect to win anything. Well we won a few. And we got a silver in the High Jump that we did not expect. How do I know this? All the commentators saying, over and over again as I was trying to hide in another room, that it was truly remarkable. When I finally poked my head around the door it became apparent what exactly it was that was so remarkable. Not our chap being able to jump high but the hubris of his fellow competitors believing they could jump higher.